We’ve all struggled with poorly designed web sites or apps before. What button do I push? Where do I enter my information? There are just too many options here. Sound familiar? Even if you’ve developed the most amazing app the world has ever seen, it’s no good if users have trouble interacting with and using it. User experience design is critical, since it can make or break your app. So if you’re interested in learning more about UX design and refining your own UX design approach, Billy is clearly the man to see. It’s good to keep your coding skills sharp, and that’s a tall order these days with the pace and scope of changes in the development landscape. There are constantly new versions of venerable development frameworks and libraries, things moving to open source, and cross-platform workarounds. It’s definitely an exciting time to be part of the development world, and one good way to keep your finger on the pulse of these changes is through the blogosphere. After all, we already know there are some great blog-based resources for Visual Studio and AngularJS, right? Four other blogs we've recently come across—three from Microsoft staffers and one from an independent expert—provide an excellent insider’s view to the inner workings of C#. Ravinder Singh is a senior software engineer at Lockheed Martin; the only one mentioned here who is not actually a Microsoft employee. One recent post covered C# CSV Library and HTTP Handlers. After looking at some original code placed in a standard ASP.NET WebForms page in the OnLoad event handler, he realized the code was better off placed in an HTTP Handler. The primary advantage of using a HTTP handler to generate the file is he could bypass the unnecessary ASP.NET WebForms page life cycle. "The existing code was using a StringBuilder to generate the CSV string in the page OnLoad event handler. As you may imagine, this looked messy and was a pain to maintain. To abstract the CSV string creation logic, my colleague introduced me to a useful CSV library called LINQ to CSV. The project page link for this library is here and the library is available as a NuGet package." Another impressive C# blog comes from Maarten Balliauw, who is indeed a Microsoft guy. 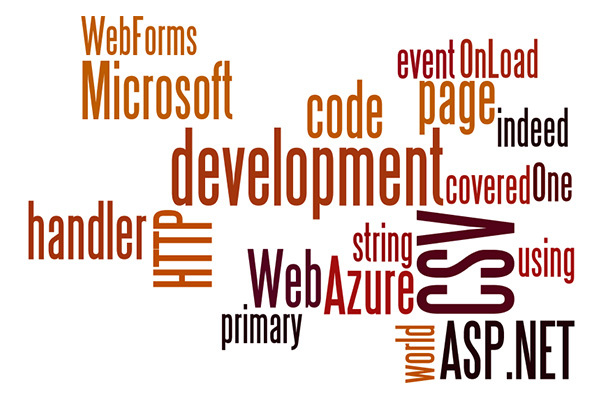 His primary interests are ASP.NET (C#) or PHP Web apps and Microsoft Azure. His self-titled blog has recently covered such topics as broken dependency chains that, as he put it, broke the Internet. There are also posts on disabling session affinity in Azure App Service Web Apps and working with a private npm registry in Azure Web Apps. Another excellent blogger, Bill Wagner just recently joined Microsoft. He’s on the .NET Core content team, focused on building learning resources for developers new to the .NET Core platform. One of his recent posts covered a potential new feature in C#, called Local Functions. This may or may not be part of the next version of C#, and he welcomes your input and discussion. "The overall effect is a more clear expression of your design," he concludes. "It’s easier to see that a local function is scoped to its containing function. It’s easier to see that the local function and its containing method are closely related." Finally (at least in this post), Joe Duffy’s blog is another to visit on a regular basis. Joe is an engineering director for compilers and languages at Microsoft. His top posts currently include The Error Model, Safe Native Code, and Asynchronous Everything. Are there any other C# blogs you visit regularly? Comment below or email llow@vslive.com with your suggestions! These days there are channels on cable and satellite TV for just about anything—history, cooking, cartoons, music, dogs, cats, clowns, politics (not sure what made me think of those last two in sequence), and more. So naturally there should be some videos available for our favorite development environment, right? After all, Visual Studio is certainly rich and deep enough to warrant several seasons of binge watching. And when it comes to Visual Studio video tutorials, Microsoft’s Channel 9 is clearly the juggernaut. However, it's not the only game in town. This entry-level video from the Windows development team is a great resource for loading and launching Windows 10 and Visual Studio for the first time. Then it leads you into developing some Universal Apps, relying on easily available online templates. Again, this is more suited to beginners, but it still gives you an idea of what else is available online—some free and some for an associated fee. User Interfaces in WPF by Robert Green and Philip Japikse. This one was shot at 2014's Visual Studio Live! event held on the Microsoft campus in Redmond, WA. Using Data Templates in XAML by Robert Green. 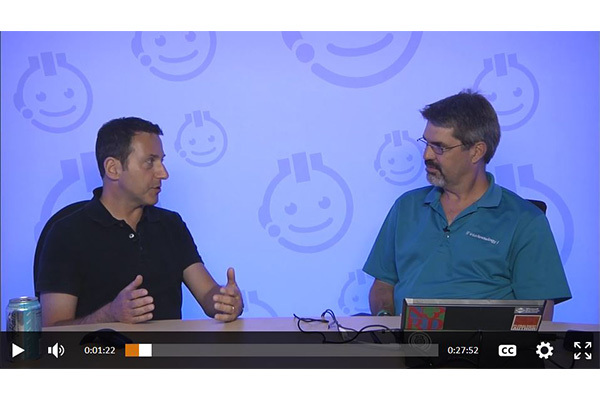 This is another great video from 2014's Visual Studio Live! in Redmond, featuring co-presenter Billy Hollis. There are a myriad other video resources for all levels of coding expertise and aspects of the Visual Studio IDE. I’ll cover more of these in an upcoming post, so stay tuned! 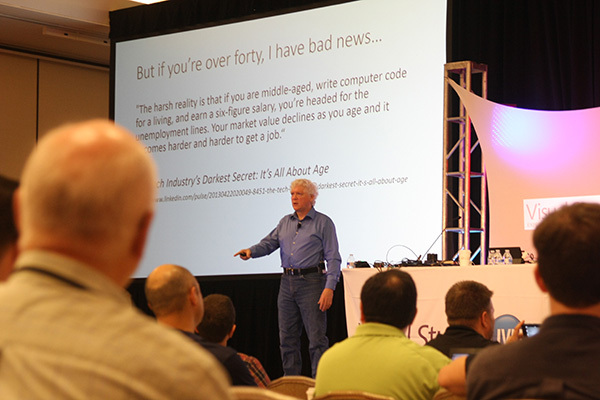 If .NET were a country, Microsoft’s Scott Hunter would clearly be one of its senior statesmen. During his general session on Wednesday, March 9 at the Visual Studio Live! event in Las Vegas, Hunter gave an overview of the current state of .NET and the impact of having it now be open source. He also ran through some the latest features and revisions to ASP.NET 5 and Visual Studio 2015 at his keynote address, appropriately entitled, What’s New in ASP.NET 5 and VS 2015. Hunter is the principal program manager lead for the ASP.NET team at Microsoft, and even he remains somewhat surprised at the new openness at Microsoft. “Everything my team does these days would have seemed unthinkable to me four years ago,” he says. Everyone learns a bit differently. As a ski instructor, I was always told people learn by doing, learn by watching, or learn by thinking—doers, watchers, and thinkers. And while everyone has a dominant learning style (I am most definitely a doer), everyone also is some combination of all three. When you’re attending sessions at Visual Studio Live!, you hear presentations and see the demos. If you like what you see, but wish you could carry some of that along when you get back to your office and back to coding on your own, fear not. Several of the Visual Studio Live! 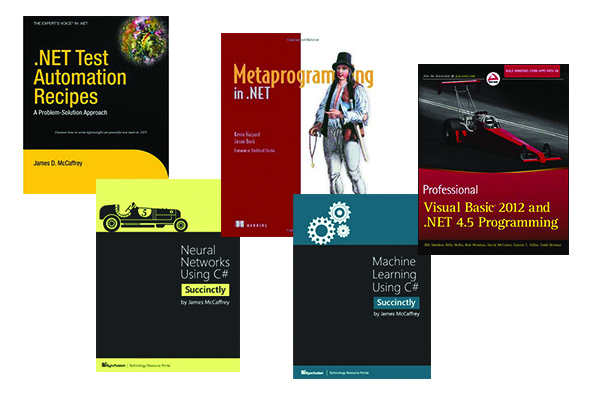 presenters, with whom you’re undoubtedly familiar, also have several leading .NET books to their credit. Dr. McCaffrey is a veteran and venerable presenter, and his latest title is just what you need if you develop, test, or manage .NET software. McCaffrey’s book provides practical techniques to help you write test automation software in .NET, as well as API testing, interface automation, and testing SQL stored procedures. All the examples presented in the book have been fully tested, so you can rest assured you’re not being led astray. After reading this intermediate level book, you’ll have a good handle on writing production-quality combination and permutation methods. James has several other books on software testing and C# coding as well, including Software Testing: Fundamental Principles and Essential Knowledge, Neural Networks Using C# Succinctly, and Machine Learning Using C# Succinctly. Billy Hollis is a popular presenter, and fortunately he writes like he speaks—lively and engaging. This extensive text starts off with a quick introduction to some Visual Basic 2012 and .NET 4.5 basics. It also dives into more advanced topics, including data access with ADO.NET, ASP.NET web programming with Visual Basic, Windows workflow, security, and threading. The book also covers .NET and Visual Basic features such as LINQ, WCF, exception handling, and debugging. Billy’s co-authors on Professional Visual Basic 2012 and .NET 4.5 Programming include Bill Sheldon, Rob Windsor, David McCarter, Gastón C. Hillar, and Todd Herman. You should be at least comfortable with C# and the .NET framework to get the most out of this book. You don’t need any experience with metaprogramming. Jason’s coauthor for Metaprogramming in .NET is Kevin Hazzard. The book features another name you’ll likely recognize. The foreword is written by Rockford Lhotka, a Visual Studio Live! Conference Co-Chair and Jason’s boss at Magenic. Stay tuned for more posts on books written by our talented group of expert speakers! We continue our series on the best Visual Studio blogs we’ve found to help you navigate the sea of available Microsoft resources. Thankfully, there is a small army of bloggers out there in the Visual Studio world looking things up and sharing their findings. Carlos Quintero has been a Most Valuable Professional (MVP) since 2004 and is a passionate specialist about Visual Studio Extensibility (VSX). A recent blog post of his discusses incorporating images into your apps to make them more consumer-friendly, resources to create high-DPI images with the new Visual Studio 2015 Image Service. He explains it’s relatively easy to become fully DPI-aware and use DPI images in your apps. He outlines and describes several of the Microsoft resources you have available. He also points out that apparently, support for high-DPI images through a new image service was indeed present in the Visual Studio 2015 RTM release, but only recently did Microsoft publish the documentation for those services. Image Service and Catalog: This tells you how to use the Visual Studio Image Service and Image Catalog in Visual Studio 2015. 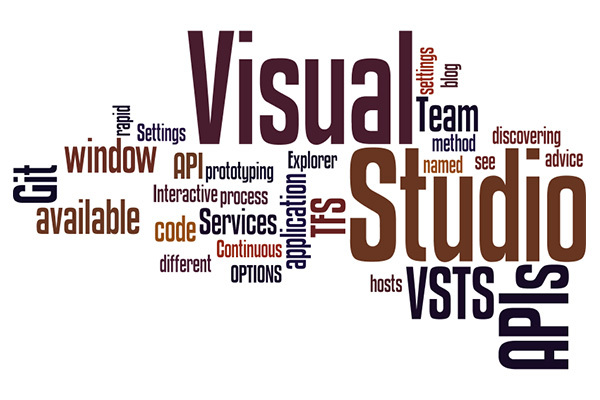 Image Service Tools: The VS SDK has tools to help you use the Visual Studio image service. Color Theming Tools: The VS SDK has several tools to help you create and manage color themes. Visual Studio’s KnownMonikers: This has images contained in Visual Studio’s IVsImageService. Visual Studio Image Library: This is now updated with VS 2015 images. EnterpriseLibrary.Config: This is a handy tool for your Enterprise Library packages, and lets you can edit your config with an interface. GhostDoc: This tool can generate summaries above your code. It will also generate documentation for parameters, properties, field, methods, and so on. NuGet Package Manager: It ought to be quite clear what this is. StyleCop: This lets you create defaults about documentation and code formats. StyleCop Checkin Policy: This is my own check-in policy for validating StyleCop rules. Ninject: This is an easy-to-use dependency container for fast building applications. And Marius Bancila, in his post Three New Features I Like in Visual Studio 2015, he outlines his favorite new features in Visual Studio 2015, starting off with the new Error Window. Next, he points out finding files in append. “I’m working with large source bases and I often need to do find in files, usually going from search to search until I find what I need. The problem was there were only two output windows for the search results and when you need to do a third you had to discard one of the previous searches while you might still needed the results.” In Visual Studio 2015, Microsoft has finally implemented an append feature. This lets you append your search results to one of the existing two windows. So the next time you run into something that makes you scratch your head with Visual Studio, remember you have a wealth of resources at your disposal in the blogosphere. Have a favorite blog you visit you’d like to share? Comment below! Angular has gained quite a bit of popularity as an open-source Web application development framework due to its intent to simplify application development and testing. Given its flexible nature, there are a number of approaches and best practices for incorporating Angular into your apps. Whether you're a dabbling novice or a proficient expert, here are four content-packed, super-informative AngularJS blogs we found that are worth a read. Heading straight to the source is a great place to start with Angular. You’ll learn more about specific tactics for developing with Angular (or AngularJS as it’s sometimes called) and stay up-to-date on the newest releases (the Angular 2.0 Beta was just announced) on the official Google AngularJS blog. Scalability is another potential issue for application development, and Angular works well there. If you’re developing with an eye toward continuous deployment or cloud platforms, this is particularly germane. Full-stack web developer Adrian Mejia, who specializes in MEAN stack (Mongodb, Expressjs, Angularjs, Nodejs), recently blogged 12 steps to take to ensure application scalability with Angular. Visit AdrianMejia.com to learn more about this 12-step process. Another aspect of application development for which Angular is well-suited is unit testing. And that's where Jason Watmore's blog comes in. Read more about how to use these libraries in your own unit testing, along with other topics, at JasonWatmore.com. What’s your favorite Angular blog? Got any feedback on the ones we listed here? Leave your comments below! Visual Studio is such a powerhouse application development platform, that there's NO shortage of expert advice available in the blogosphere these days. To help you navigate the resource waters, we dove head-first into this information ocean to find the best Visual Studio blogs for advice and guidance. Here’s part 1 of our findings, focused on ALM, TFS and VSTS. Click here to check out this excellent blog. See the rest of Graham Smith’s blog posts by visiting PleaseReleaseMe.net. For a wealth of tips and tricks on TFS and ALM, you don't want to miss Jesse Houwing’s blog posts. Stay tuned for more of the best of the best from down in the trenches with Visual Studio. Have a favorite ALM/TFS/VSTS blog you’d like to share? Comment below! As 2015 comes to a close, it's been a great year in the Microsoft ecosystem when it comes to tools and technologies. Yet as a development team member, it can feel overwhelming when you have to keep up with all of that. As my fellow Visual Studio Live! conference co-chairs Andrew Brust and Rockford Lhotka and I started planning for the 2016 shows, we worked hard to make sure we had the right mix of cutting-edge tech, best practices, and topics you really need to know. As we did our advance planning, we left some openings in the Visual Studio Live! Las Vegas (March 7 – 11 at Bally's Hotel & Casino) agenda that we could fill later, so we could make sure we were prepared for the latest innovations coming from Microsoft and others in the industry. This brings us to our first batch of added sessions, now available, where you'll find five of our top speakers, bringing you topics you need to know in 2016. First, there's Miguel Castro and his session, "End-to-End Dependency Injection & Writing Testable Software." Quality continues to be a hot topic in the industry and, while for some, dependency injection is old hat, many developers are still in need of a solid grip on how and when to use it, and understanding the correlation between it and increased testability/quality. Castro is an experienced software craftsman and this session will be filled with his hard-earned best practices. Jumping to the other end of most applications, we have Leonard Lobel's "Exploring T-SQL Enhancements: Windowing and More." Persistence in the data tier is the foundation of most applications, and SQL Server continues to be the go-to data store for companies who want the richest feature set on top of a rock-solid engine that's proven over and over in daily use. Lobel is an expert who works daily with SQL Server to find out how to get the most out of it. This session will bring those insights straight to you. 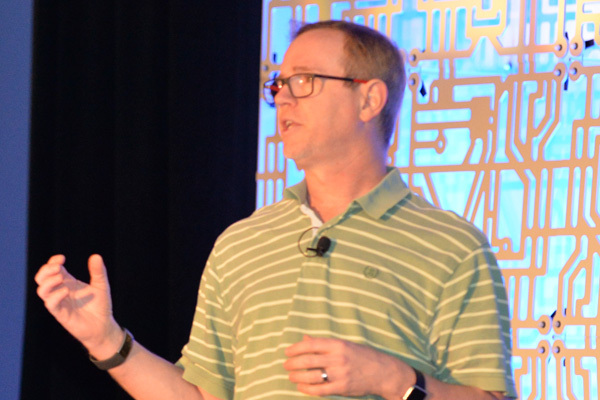 Continuing with the data theme, Walt Ritscher brings us a brand new session to VSLive! : "Pretty, Yet Powerful. How Data Visualization Transforms the Way We Comprehend Information." No area is hotter than data science. A critical part of that is how you present the enormous amounts of data gathered daily -- whether it's product data, customer usage data or even operational data -- to the consumers of the systems you build. Ritscher will provide you with insight on how to choose the right visualization technique for your data, in a clear and understandable fashion. And, finally, our last session in this batch is from conference co-chair Rockford Lhotka. Lhotka is a pioneer in the Microsoft world having brought his CSLA Framework forward from its roots in Visual Basic and COM to the modern world of cross-platform .NET on the desktop, servers, and mobile devices including iOS and Android. In "Building Cross-Platform Apps Using CSLA .NET," Lhotka will show you best practices for sharing code across all the Microsoft .NET Framework stacks, how Xamarin enables you to use C# and .NET, and get reuse out of nearly 100 percent of your business-layer code. So there you have it, just in time for the holidays, five great new sessions added to the already huge list at Visual Studio Live! Las Vegas 2016. All of us at Visual Studio Live! wish you safe and happy holidays, and look forward to seeing you all in 2016! With so many new technologies and toolsets coming to the forefront, universal apps, collaboration, mobile apps -- you've got to stay on your toes just to keep up in the development world. There's increasing emphasis on "softer" skills like intuitive app design and drafting precision DevOps processes, as well as continued top-notch development with some of the newer tools and technologies like NoSQL, AngularJS and Roslyn. Whew -- that's a lot! As always, if you need to find out more about Visual Studio Live! events, just check out the homepage. See you sometime next year!